March 24, 2011 - The Federal Aviation Administration determined that the oxygen generators located in the bathrooms of some 6,000 U.S. commercial registered aircraft posed a potential threat to the safety of flight ordered all U.S. airline carriers through an airworthiness directive (AD) which was issued on March 8, 2011 to remove them. To date all oxygen generators have been removed from commercial aircraft. The oxygen generators onboard aircraft provide emergency oxygen in the event the aircraft should suddenly have a drop in cabin pressure. In such an event an oxygen mask would drop down throughout the aircraft including the lavatories (bathrooms), providing passengers with sufficient oxygen until the aircraft could descend to thicker more breathable air. 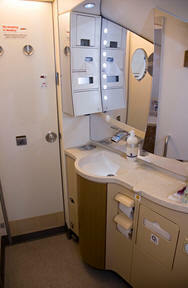 The European Cockpit Association (ECA) which represents over 38,650 European pilots and flight engineers from the National Flight Crew Associations in 38 European countries has reported that they have concerns with the removal of the oxygen generators from the lavatories U.S. commercial aircraft and the concern such measures maybe adopted overseas. ECA reports this modification could have serious implications for crew and passengers safety. In case of a sudden and rapid decompression the chances for the lavatories? occupants to survive could be extremely low. The ECA is concerned that other European Member States could take similar decisions. According to ECA aviation security experts, this move will create a safety hazard when there is a decompression in the aircraft at high altitude. In the event of decompression crew and passengers located in toilets will not be able to get oxygen, possibly resulting in unconsciousness but, in the worst case scenario, in death by suffocation. There are currently no alternative safety equipments or procedures in place to avoid such a situation. To our surprise passengers are not seem to have been informed about the risks they now incur when going to the restroom. At a normal altitude of 35000 feet the time a person has to reach an oxygen mask is 30 seconds before falling unconscious. A pilot or a crew member has to get an oxygen mask within 10 seconds before his or her judgment starts to alter. At a higher altitude and with the oxygen rarefaction this period falls to 5 seconds. Pilots and cabin crew are trained to face decompression events but with no doubt it will take them more than 30 seconds to reach their seat, put their own oxygen mask and start checking all the lavatories on board. This is without mentioning that they may be themselves in the toilets at that time. In case of decompression the pilots will try to get the aircraft down to a safe altitude as soon as possible. But mountain relief or other aircrafts in the vicinity might temporally prevent the descent procedure. In case one of the pilots is in the toilet the remaining pilot will have to perform this procedure on its own with this added stress factor of not knowing if his or her colleague will make it back to the cockpit. What are the reasons behind such a measure? The FAA and the US intelligence services have identified a theoretical security threat related to the oxygen generators. One would expect that when there are no immediate threats one could expect alternative safety equipments to be designed and installed first. ECA is concerned that a standing federal safety agency such as the FAA puts security first at the detriment of safety. During the last 6 months there have been more than 16 cases of decompression reported on European registered aircrafts. Although most of them were not serious it shows that the possibility of a decompression is real. ECA is seriously concerned by the FAA move and encourages the EU countries to not adopt similar measures despite the fact that the French DGAC seems to have already taken a similar approach. As long as there are no alternative ways of providing oxygen in the toilets, the oxygen masks should not be removed.